I can do you some MUSIC. Check out the sounds on the iTunes player on the right. I can do you some PERFORMANCE POETRY. I can PERFORM for you and/or write to order. Email me if you want to commission Mama. I can do you some MCing & HOSTING for your event. Check out my testimonials here to see what other clients think of my hostess abilities. Ahem. I can do your WEDDING. I’m an Ordained Dudeist Priest in the Church of the Latter Day Dude. Mama gets 4 stars in music mag! 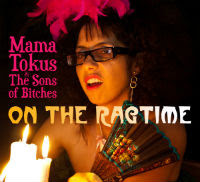 Hear Mama's radio show for the Home Cookin series of poetry podcasts: Mama's Soul Stew, a fine portion of her poetry, with plenty of her influences, some musical interludes and a dash of feminism. An hour of words, soul, blues and funk, philosophy and thought to satisfy your hungry minds.